His explanation of the days’ events consisted solely of graphic descriptions of what gowns Jeanette was wearing and how she looked in them…details of her lovely shoulders, her beautiful skin, her low-cut bodice, etc. When Sybil cynically asked whether Nelson did anything else on the set except stare at Jeanette, her point went totally over his head. 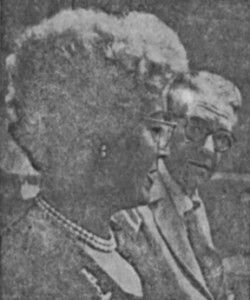 And even a very grainy newspaper shot from the late 1950s. Yes, it’s poor quality but one thing is certain, Nelson is still just gazing at her. Per Nelson’s own words, he was initially speechless at her beauty – “she would take your breath away”, he said. And even though he initially came on too strong, too intense, and even proposed marriage to her a week after their first date, he subsequently discovered his manners. 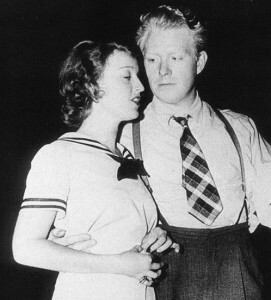 After an initial bout of strong interest between them in late 1933 and into 1934, during which time Jeanette pushed for Nelson to co-star with her in Naughty Marietta (and the trades announced his casting), there was then a cooling-off period where Jeanette basically told him – no. This despite photos of them taken together at the studio in June and the fact that Jeanette had even earlier given him a dog, Sheba. So it took Nelson by surprise that he ultimately was given the role late in the year, he thought he had “blown it” with her. Nelson Eddy was a shy man, initially very reserved and tongue-tied with Jeanette. His mother no doubt lectured him severely about how to properly court Jeanette (once she finally approved of her). Yes, it is incredulous to think that he was such a naive misfit in the wildness of early 1930s Hollywood, a man who courted an established movie star with flowers and letters and held back from being “an animal” as he later termed it. (At least until he was pushed beyond his limit with her.) He was a mixture of a Victorian gentleman yet so obviously overwhelmed by her that he comes off as – well, a love-sick puppy dog. 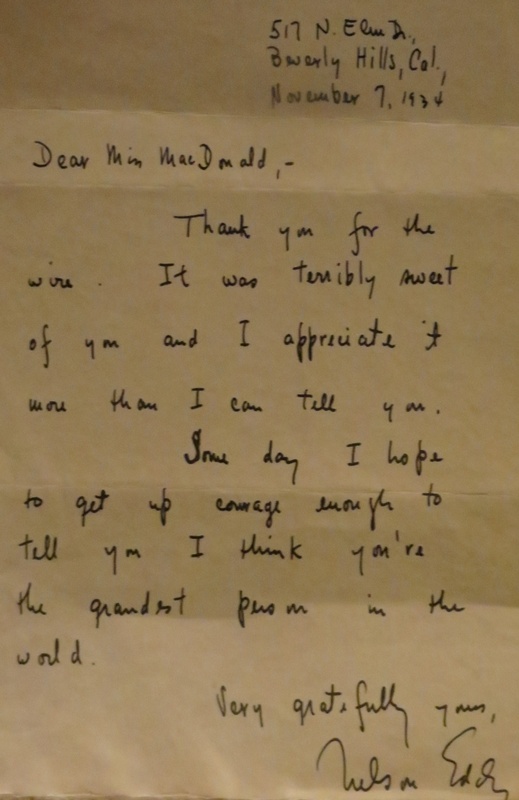 I want to thank Elizabeth Nocero for sharing the original of this letter with us. Elizabeth has a classic Hollywood blog at this link. 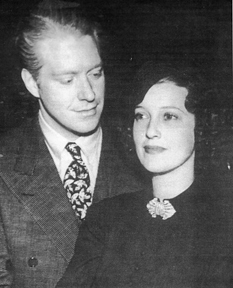 « The Gene Raymond connection, part 1	» Happy Birthday Jeanette MacDonald! A new era of truth begins!